Peppermint brownies: Fudgy brownies studded with extra chocolate chunks, laced with a hint of peppermint, and topped with melty morsels of the best kisses in the world. Growing up, I was all about cherry-flavored candy canes. You know: the rainbow-colored ones! These days candy canes come in all different flavors so theoretically, I should be in heaven with all the choices, but for some strange reason, as an adult I have developed this insane love for peppermint. 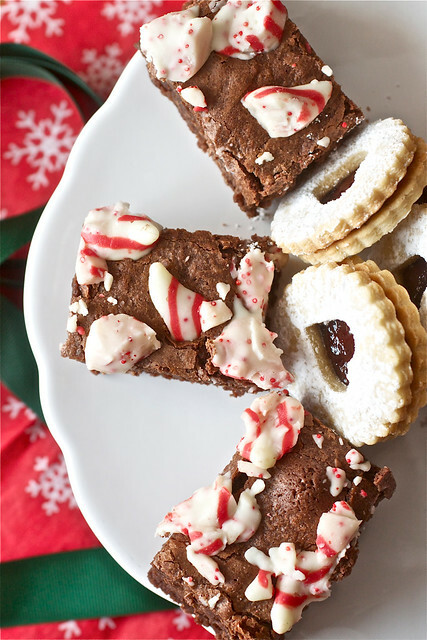 And these peppermint brownies are exactly what satisfy every craving I have at Christmastime. These rich dark chocolate peppermint brownies have a layer of milk chocolate chunks inside and are topped with Hershey’s candy cane kisses. Do you remember the year these candy cane kisses came out? It was like a freaking Hershey’s Kiss revolution! WHITE CHOCOLATE KISSES!? WITH PEPPERMINT?? They just about knocked the world off its axis! White chocolate and peppermint lovers rejoiced! I certainly did! 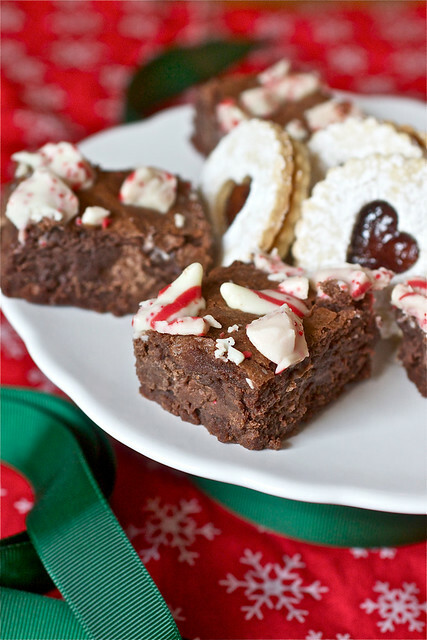 And these kisses work just so perfectly set atop these peppermint brownies. They not only look festive but they’re also a simple way of adding a little extra sweetness to these rich brownies. And they will make any holiday package or treat tray sparkle! Especially if you pair them up with some showstopping pecan linzer cookies with raspberry filling. Both Kyle, who only mildly likes peppermint desserts, and I truly fell for these brownies. So much so, that I had to wrap quite a few up to freeze before they all mysteriously vanished from the house. Luckily though, I’m in charge of desserts again at Christmas so pulling them out of the freezer will make for a quick and easy addition to my dessert extravaganza! Happy Christmas baking, friends! These brownies freeze exceptionally well so they’re a great choice to make in advance if you’re expecting holiday company or have treat packages to assemble. Combine the chocolate and butter in a heatproof bowl set over simmering water; heat, stirring occasionally, until completely melted and smooth. Remove from the heat. In a large mixing bowl, whisk together the chocolate mixture with the sugar and eggs until well blended. Whisk in the peppermint and vanilla extracts and the salt. Whisk in the flour just until incorporated. Spread half of the brownie batter into the prepared pan. Layer with the milk chocolate pieces. Spread the remaining batter evenly over the milk chocolate pieces. Bake 30-35 minutes. Remove the brownies from the oven but keep the oven on. Sprinkle the chopped Candy Cane Kisses over the top of the brownies and return the pan to the oven for 3 more minutes. Transfer the pan to a wire cooling rack and let cool to room temperature. Chill the brownies until the candy topping has firmed up. Slice and serve. Love this! I am a sucker for any and all peppermint recipes! I’ve been itching to make Peppermint Brownies all season long. You’ve convinced me :). I’m making them asap! These look great. I’m currently breastfeeding (so no peppermint) so I’ll have to make these with my candy-flavored canes!! 🙂 YUM! these look fantastic! i’ve been wanting to make peppermint brownies this holiday season too but haven’t quite done it yet! yum! Yum and Buzzed! Brownies and mint are such a great go together. Love this! I am thinking I may be in need of some brownies…. I can put the cookies aside for a few minutes to whip these up (I hope. Cookie overload). Love the peppermint candies on top. So festive! I have an insane love for peppermint too! These brownies look amazing! I love chocolate and mint, especially during the holidays. These brownies look delicious! I have always loved the regular plain old candy cane like the ones used here. That love translates to brownies quite easily. Wonderful looking treat!